With more than 60 instructor-led classes each week, you’ll have plenty to choose from when you are looking at exercise classes in our Bethlehem gym. From fitness boot camp to cycling and more, there really is something for everyone. If you are looking for a new challenge in your exercise routine, though, you need to check out our anti-gravity exercise class (click on that link to check out a video of the classes in action!). 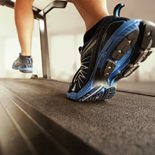 The exercise technique has actually been around since 1991 but it’s only now becoming popular for its benefits in health clubs around the country. The exercise requires some specialized equipment, such as ceiling-suspended hammock-like devices, so you won’t find it in a lot of locations. But when you do (like at our Bethlehem gym! ), you need to try it out. Here are ten reasons that you should sign up for one, too. It works on your core strength.Anti-gravity exercises actually provide a total-body workout, helping you strengthen your body from your head to your toes, but it’s especially good for your core strength. Hanging on the suspended hammock requires you to engage your core to maintain your balance and move into the different positions. That core strength doesn’t just mean a flatter, firmer belly, but increased strength and ability to recover from injuries faster. The exercises decompress your spine. The aerialist routines used in anti-gravity classes require participants to do a variety of yoga poses as well as hang upside-down in the hammock. These movements help to stretch and lengthen the spine. You can actually become taller after a class thanks to your spine stretching and decompressing! Decompressing your spine is something that is often recommended by chiropractors to alleviate pain from conditions such as herniated discs and sciatica nerve pain. It’s perfect for those working at a desk all day. A lot of people are stuck behind a desk all day for work, logging 8, 9, 10 or even more hours of sitting in a desk chair each day. That’s not good for your health, and it’s especially not good for your back. The combination of strength exercises, yoga, and dance used in the anti-gravity classes are great for getting in exercise and combatting the effects of a sedentary lifestyle. Great workout for those with back pain. This is one of the benefits that people talk about the most! Many people, even those without back pain, note that their backs feel so much better after they’ve been to an anti-gravity class. That’s because the movements take inspiration from yoga and dance, working to lengthen every muscle in your body, especially those in your back. The decompression that happens can help alleviate pain, too, so you leave class feeling better than you went into it. It merges athletics and dance. If you love to move, this is the class for you. Anti-gravity classes take their inspiration from a variety of disciplines, including athletics, dance, and the aerial arts to combine them into one class. You’ll learn new ways to move your body, strengthening and stretching as you go. It’s great for those who love to dance but need to get strength into the mix, too. These classes are great for increasing your flexibility, thanks in part to the yoga inspired moves. It’s especially good for flexibility in the spine and shoulders since these areas of your body will be controlling a lot of the movement that’s happening in the hammocks. You’ll notice the increase in your flexibility within just a few sessions and be amazed at the difference this can make in your pain levels. Brings greater awareness of your body. Anti-gravity classes are all about bringing greater awareness to your body. You’ll gain control over muscles you didn’t even know existed as you work through the movements and master the aerial arts. That control will increase your body awareness as well as your gracefulness, flexibility, and strength. Many students feel more connected to their body than ever before. It could help you recover from injuries faster. The yoga movements and increase in your muscle strength could actually help you recover from injuries faster. Some participants noted that they are recovering from workouts faster since they started anti-gravity exercise classes. That makes it a great companion class for those who are runners or training for a sport. It has emotional benefits, too. Being suspended in the hammock, swinging, moving, and being suspended aren’t just great for your physical health! This is an exercise class that’s great for your emotional well-being, too. You’ll experience the flood of endorphins that come from a great workout, giving you fuel for the rest of your day (or even the rest of your week!). That can elevate your mood, keep anxiety at bay, and can even help you sleep better at night! The bottom line is this: these classes are a ton of fun. If you are easily bored in other exercise classes and want to find something that will challenge you, keep you interested, and is actually fun, then this is the class for you. Are you curious about anti-gravity classes in Bethlehem? You can come try one out for yourself! Simply visit our website and fill out the form to claim your free pass. That will allow you to come in and experience one of our anti-gravity classes for yourself. We welcome all ages and skill levels, and our talented and experienced instructors will make sure that the difficulty level is tailored to your needs. If you don’t like it, you can try out one of our other classes, including fitness boot camp, spinning, and so much more. Sign up to become a member of Steel Fitness and you’ll get to join in any of our 60 or more instructor-led classes each week. Choose as many as you want–they are included in your membership fee! Have questions about one of our classes or about becoming a member? Give us a call or use the contact form to reach out to our team today. Fill out the form below and one of our team members will get back to you as soon as possible!